My 25 years of Orthodontic experience as a Registered Dental Assistant influenced my decision to become a part of Gluck Orthodontics in April 2001. As a Treatment Coordinator, I start patients on the journey to a beautiful smile. From the moment our patients walk in the front door to the time they leave, everyone’s experience is unforgettable. I am an animal lover and stray cats and dogs always seem to find my home. My husband and I enjoy traveling to visit our family and friends. My favorite hobbies include reading, gardening, and sewing. Having spent “many years” in the medical field, it has been very refreshing to me to have the privilege of working in this office since 2005. As the financial coordinator, I build relationships with the wonderful parents of our patients. I appreciate the opportunity to work with such a knowledgeable and fun group of individuals. I love vacationing with all of my family when we can (beach!!). I also enjoy sports, gardening, reading and cooking with my husband and our families. I am a Treatment Coordinator and Marketing Manager at Gluck Orthodontics. I have been privileged to work here for the over ten years in various areas of the office. I love that each patient receives the highest quality of care available in a caring and committed atmosphere. I have seen many changes during my 20+ year career in Orthodontics, and Dr. Gluck is constantly on the cutting edge of patient care and technique. When people ask me about Dr. Gluck, I call it the “Gluck Experience”, and I am honored to be a part of this practice. Outside the office, my husband and I are enjoying being grandparents. Reading, going to movies, and being at the beach are my ideas of relaxation. I have worked in Orthodontics as a Registered Dental Assistant for over 20 years and began working at Gluck Orthodontics in August 2010. I am both a clinical assistant and the Clinical Coordinator. My favorite part of working with Dr. Gluck and the other team members is that we each genuinely care about each patient. I love knowing that I am making a difference in their life by putting beautiful smiles on their faces! I enjoy spending time with my family, shopping, gardening, and boating when the weather is warm. I began working for Dr. Gluck in 2011 at the front desk and became a Registered Dental Assistant soon after. Working at Gluck Orthodontics keeps me challenged, and interacting with our patients has proven to be a very fulfilling experience. Outside of work, I love cooking and trying new recipes (I can tell you anything you want to know about food!). My favorite time of the year is when college basketball begins, as I am an avid Louisville fan. I began working for Gluck Orthodontics in 2012 as a Registered Dental Assistant. In the office, you can usually find me using the iTero scanner to create 3-D scans of Invisalign patients’ teeth. Working with Dr. Gluck has allowed me to work with the most fun and caring people I have ever met! I love spending time with my family, cooking, baking, and painting. I joined Gluck Orthodontics in 2012 as the scheduling coordinator. I love helping to create a legendary experience for our patients each day. When I am not at work, I enjoy spending time with my family, photography, and reading different genres of books. I am looking forward to many more years and memories at Gluck Orthodontics! I started with The G-Team in May of 2013. I love and am honored to be working with such a professional and gifted team. 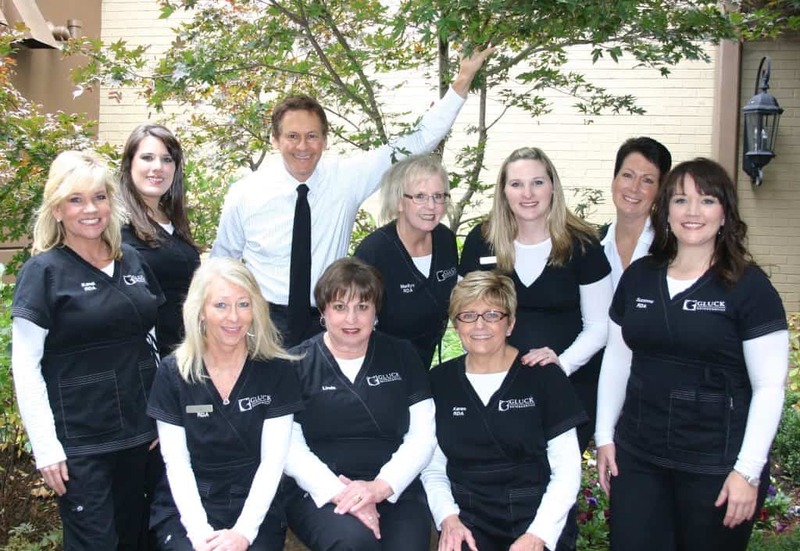 Everyone at Gluck Orthodontics works daily to ensure the highest quality of care and compassion. It might sound corny but it is truly a joy to come to work each day. Outside of work I love spending time with my wonderful husband, dinners out with my amazing friends and vacationing at the beach! Meet Dr. Joel Gluck here!